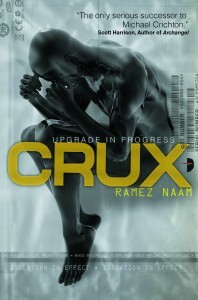 Many moons ago, my ever loving wife introduced me to a really interesting dude by the name of Ramez Naam. Or Mez if you will. She worked on a piece of non-fiction, futurist writing for him, but now he’s writing some very good science fiction you might want to check out. If you have not read his novels yet, they are worth your time. I just finished his first, Nexus, and really enjoyed it. I’m reposting here because his publisher has a giveaway right now. All you need to do is head over to Adventures in Sci-Fi Publishing and make a comment. Be a winner!